September 2018: Atlantis, The Palm and leading F&B operator, Solutions Leisure, have joined forces to create a revolutionary dining and entertainment venue, called Wavehouse. Located at the iconic entertainment resort, the hotspot is due to launch in Q1 2019 and will well and truly shake up Dubai’s definition of dining, entertainment, and nightlife. With a ground-breaking approach including a family-friendly restaurant, sprawling terrace, four-lane bowling alley, a climbing frame, a kids’ play area, gaming zone and adult-only bar, Wavehouse brings an exciting first to the GCC with the inclusion of a dedicated Wave Rider, a state-of-the-art wave machine allowing guests to feel the rush of surfing. Set within the iconic Atlantis, The Palm, overlooking Aquaventure Waterpark, the rustic-beach-bar-meets-industrial-gastropub will be in a league of its own, seamlessly blending adult downtime with family activities and interactive adventures. Combining an upbeat atmosphere with a relaxed, contemporary design, Wavehouse will be the ideal location for Dubai residents and tourists alike to spend a chilled-out afternoon in the sun before kicking back for an evening of eats, beats and entertainment with live bands, DJs and various special events throughout the week across indoor and outdoor stages. 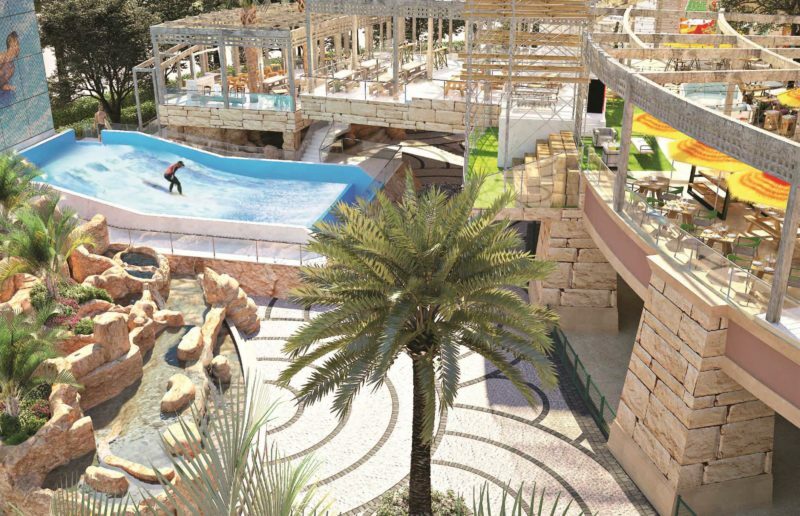 A key feature of Wavehouse, the ultramodern Wave Rider machine will be available to both waterpark and Wavehouse guests, with prime viewing from the sun-drenched terrace. As the only licensed venue immediately accessible from the waterpark, guests can jump out of the water and into the beach-themed changing sheds to dry off before quenching their thirst at the outdoor bar. Boasting a mouth-watering menu of lunch, dinner and snack options, Wavehouse will cater for both the health conscious and the comfort food-seekers, with everything from gourmet burgers, mega shakes, and pizzas to fresh salads and light bites.